Many mattresses who claim to be "Organic" say they use wool as the flame barrier. While wool would pass the old cigarette test for mattresses, it will not pass the new open flame test. 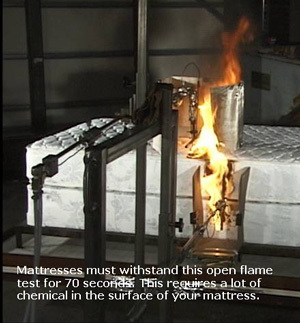 These mattresses either use chemically treaded wool, another chemical system, or rely on chemically treated cotton batting (Boric Acid and Antimony) to pass the open flame test. There are no natural, chemical free, or nontoxic systems that pass the severe open flame test. Even what they call "inherently fire resistant" fibers contain chemicals in the fiber itself. There are no labeling requirements for the FR chemicals in mattresses. Thus, most mattress manufacturers deny using chemicals. It is unfortunate that even "Organic" mattress makers often claim to use no chemicals when a prescription mattress would be chemical free. You can see in the table above that wool or any untreated fiber including cotton, rayon, nylon, or polyester will not pass the open flame test for mattresses. The flame temperature is more than three times that required for ignition. Plus you can see proof in the burn photos above or with your own test. There are two ways, and only two ways, to make a fiber fire resistant: 1) Coat the fiber with FR chemicals, 2) Manufacture the fiber with FR chemicals incorporated into the fiber itself. These are called "inherently fire restraint" fibers. The US Consumer Products Safety Commission (CPSC) did not want the public to know the FR chemicals contained in mattresses (they are all scary), so there are no labeling requirements. Mattress manufacturers do not want to admit using chemicals so they say "we use a natural system" or "we use wool" or "we use 'inherently fire resistant' fibers." Again, 'inherently fire resistant" fibers contain chemicals, such as Antimony in the fiber itself in Modacrylic fibers. "The present invention concerns methods of inhibiting the burning of natural fibers (e.g., wool, wool fibers, animal hair, cotton), synthetic fibers (e.g., acetate, nylon, polyester, viscose rayon), or blends thereof (e.g., wool/cotton blends), or fabrics or yarns composed of natural fibers, synthetic fibers, or blends thereof, involving treating the fibers (or fabrics or yarns) with polyamic acid or at least one polyimidesiloxane or mixtures of polyamic acid and at least one polyimidesiloxane." "Conventional chemical treatments to confer flame resistance to wool include treatment with the flame retarding agents applied to cotton, such as salts of borate, phosphate, metals, and tetrakishydroxymethyl phosphonium, and titanium compounds. Zirconium complexes under the trademark Zirpro™, issued by the International Wool Secretariat, are one of the successful flame retardants for wool. Many modifications of the Zirpro™ process according to specific needs have been made. For example, tetrabromophthalic acid (TBPA) is used along with Zirpro™ to obtain low heat release wool. However, zirconium salts have the environmental disadvantage of zirconium being a heavy metal." Lanolin burns, as would any animal oil. Fire Extinguishing Media: Dry chemical, foam or carbon dioxide." You can see above Lanolin burns at an even lower temperature than wool, 445C vs. 600C, (it is not a natural flame retardant), and it requires dry chemical, foam, or carbon dioxide to extinguish the fire. From "Commonwealth Scientific and Industrial Research Organization (CSIRO):"
"The evolution of increasingly severe mandatory flammability regulations in many aspects of domestic, social and business life has meant that even inherently low flammability fibres, such as wool, require a flame retardant treatment for some applications. Typical applications subject to mandatory flammability requirements include children's nightwear, domestic and commercial furnishings, public transportation and protective clothing. … "
One organic mattress maker was quoted in the Chicago Tribune article as saying he spent over $100,000 in burn testing to find the right combination of cotton and wool to pass the open flame test. They could have spent 100 million dollars and would not be able to find a combination of untreated cotton and wool to pass the test. Untreated cotton will even ignite from cigarettes. Since the 1973 cigarette ignition law for mattresses they have been adding 10% Boric Acid (Roach Killer) powder as loose dust to cotton batting to pass the cigarette test. Since the open flame test they now also add Modacrylic fibers, which contain Antimony Trioxide, to cotton batting to pass the open flame test. See CPSC Table 1, item 1. Cotton burns at 255 degrees and untreated Wool burns at 600 degrees. The open flame test is 2,000 degrees for over a minute. It is scientifically impossible for a blend of untreated cotton and wool to pass the test. No one wants to admit using chemicals in their mattresses, especially ones who claim to be organic. Organic Certifications: We question the value of organic certifications. Companies pay money to these organizations to get certified and provide the information they want them to see. But these organizations do not know about the chemicals added to pass the new flameproof mattress regulation. Unfortunately almost all the organic mattresses strongly tell people they use no chemicals and that their untreated wool passes the test. They also sometimes say the fire proof wool is compressed or densified and this blocks the oxygen and fire. We don’t believe this either. The above wool system where they admit adding chemicals is also densifed or compressed. The logical questions is that if some organic mattresses have to add chemicals to pass the open flame test, don't they all have to? The answer is Yes! As you can see in all the proof above everything organic burns, there are no natural, chemical free, or nontoxic mattresses that comply with the federal regulation. They all contain toxic chemicals. Your only choice for a chemical free mattress is by prescription.